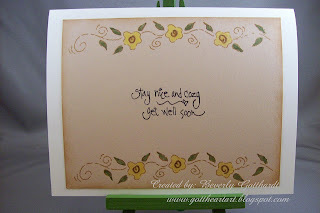 Before I get onto my card I'm going to tell you about a little comparison test my friend and Stampin Up demonstrator Linda asked me to perform. There is always the issue of adhesive and adhesive dispensers. The cost, ease of changing cartridges, permanent, removable, to name a few. I compared the Glue Glider Pro and the Snail from Stampin Up. The Glue Glider Pro is a cute pink and green dispenser, light weight, easy in the hand. The adhesive comes out of the dispenser in a continuous line of small rectangles and their permanent is permanent, I've had a little bit of a learning curve with this one because I can't always seem to get to the edges like I like without going over. When I fold back what I've gone over with it seems a little thick. The Snail is a small sleek dispenser, controlled more with fingers than the whole hand. The adhesive comes out in a continuous thin strip. I was able to get all the way to the corners without having to run over and fold back, I did notice that as the adhesive is dispensed I got some little balls of build up on the left or right edge of where you press down to dispense, easy enough to pick off, but an issue, again permanent is permanent. The Glue Glider Pro is a 40' cartridge, the Snail is a 39.33333' cartridge, pretty close. I found the best price on refills for the Glue Glider at Scrapbooking Alley for $6.35 each. Of course, I will order my refills for Snail from Linda for $4.50 each. I used the Snail first and made my cards the way I always do, no skimping, 4-5" X 6 1/2" and 5-4" X 5 1/2", I was shocked to discover that I was able to complete 5-5" X 6 1/2" cards only 3/4" done with the Glue Glider, I had to get out another refill to finish the cards. This comparison was not done to put Glue Glider Pro to shame or anything like that, I have enjoyed using it, but I believe I'm going to change over to the Snail, I think I'll come out a little bit more economical on it, and it will help Linda's business, it's always nice when we can shop locally or help out small business owners. 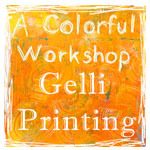 I have to say also that I have found Stampin Up products to be very high in quality. Now,This is the get well card I created for my friend's batch, next will be sympathy and hopefully in the mail late tomorrow, but knowing me, first thing Tuesday. How about those hub caps? Pretty cute, oops, maybe kind of cool. You can tell I'm not up on current slang. There you see my new corner heart punch and it's a good thing I ordered them when I did because I hear they are on back order.You'll love them when you get yours. 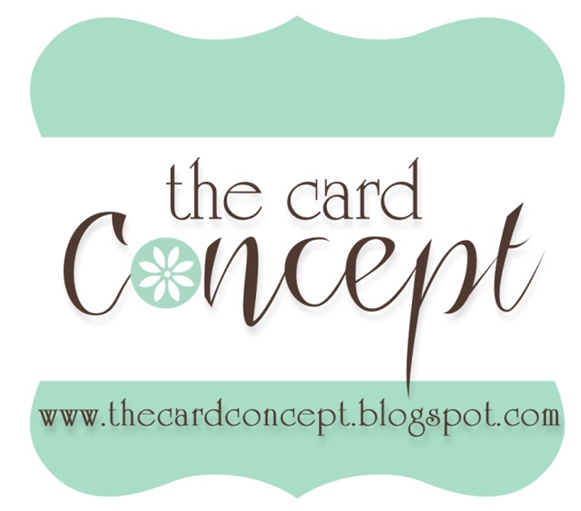 Supplies: Ivory Card Blank 5" X 6 1/2" Halcraft, Papers: Stampin Up, Flair Designs Inc-Spicy Dots, Stamps: Stampin Up-Loads of Love, CTMH-D1154 Love In Bloom, Print Works-Q004 Caring Thoughts, Ink: Ranger Archival Ink-Jet Black, CTMH-Z2108 Brown Bag, CTMH markers-white daisy, garden green, black, sunny yellow, chocolate, silver gel pen, Stampin Up-pinking hearts corner punch, silver metal dots, ribbon-Michael's, buttons, pop dots. Beverly, your card is just so darn cute!! I am home today, hoping to make some cards - ha! I'll probably sleep all day. I'll have to check out the Snail from SU - thanks for the comparison. Gorgeous card!! Love the colours. An interesting comparison ... thanks for that!! 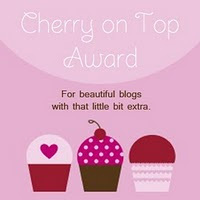 Your card is adorable and I love the button/ribbon treatment!! Thanks for joining us at Raise the Bar. We do hope to see you again next challenge! Omigosh! 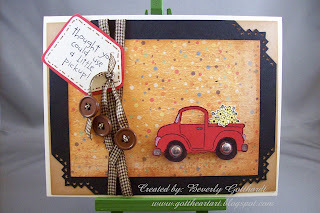 Your little truck card is so cute!! Love the ribbon/button treatment. Thanks for playing in the CCEE challenge!